Observing a youth basketball tournament from the stands without a camera in hand or a notebook to write is something we do not do often. However with the way the tournament turned out to be it was a good choice. The Czech Republic, France, Netherlands and Spain all went into the final day with a chance of coming away with the winner's trophy, something that to our knowledge has not happened before. With the change in FIBA Europe rules this year with three teams facing relegation from Division A, the four bottom teams from each group will play in the relegation round from which ONLY one team survives. So the fight to avoid the relegation round will be more intense. Although relegation was not an option in Poinçonnet, the losers of the first game between the Czech Republic and the Netherlands knew that they could leave the tournament empty handed. Their match was intense from the tip-off, the Czech Republic were not intimated by the speed or the physical nature of the Dutch team and ended up winning by a comfortable margin (65-53). This result meant that Spain could not win the tournament and if France lost then they would be last. 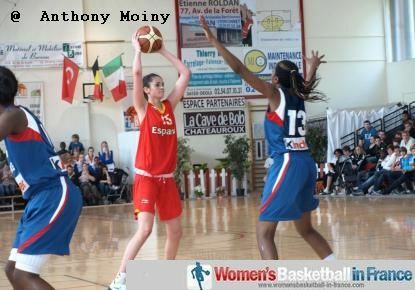 As U15 Spain beat France by 25 points. But for this match Spain had to do without the services of Itsaso Conde who had injured her foot on day 2. 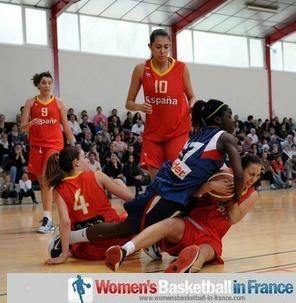 The first ten minutes of the game between France and Spain produced the best basketball of the tournament, excellent defending, good passing and excellent shooting from beyond the arc. France led early on (11-7) but the teams were tied (14-14) at the end of the first quarter. France stepped on the accelerator at the start of the second quarter with an 8-0 run. Spain never really recovered and scored just 4 points during the quarter. 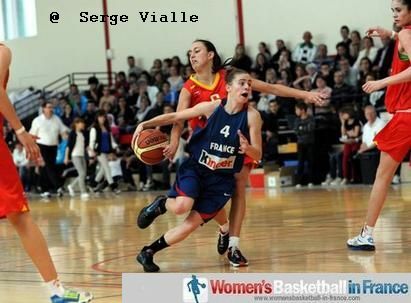 France led (31-18) at the break and managed to defend their advantage all through the third quarter. Evaristo Pérez was more fired up than his players and talked his way into a technical. All the same France led (46-33) going into the final quarter. Spain had a little run to trail by 8 points at one stage but got no closer. 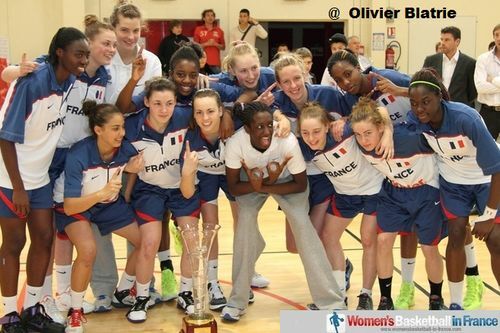 France won the game (54-46) to lift the trophy. The Czech Republic ended up with the second place trophy, while Spain had to be content with third place and the gallant Dutch were left with the wooden spoon. France: Duchet 5, Limousin 6, Balle Bonza, Bouderra, Combes 2, Dambach 7, Blatrie 12, Bakadio 5 , Milapie 4, Cirgue 9, Turmel, Bankole 4. Spain: Vicente, Salvadores 11, Cazorla 5, Lo 2, Molinuevo 5, Quevedo 17, Clavero 2, Capella, Conde, Begona Calvo, Zaragoza, Romeo 4. All Tournament team: Emese Hof (Netherlands), Klára Křivánková (Czech Republic), Ángela Salvadores (Spain), Laura Cornelius (Netherlands), Alix Duchet (France). At the end of this youth basketball event last year Italy came bottom without a victory and we wrote "Despite leaving France without a victory, Italy have four months to find a winning formula". Italy went on to finish third at the European Championship. This event is just a test series and for some players the first time playing for their country outside home soil. All the teams have things to work on and will have to improve in order to become the 2013 U16 youth basketball champions of Europe. The Netherlands are getting more organised every year and showed a lot of good things, at times the coaching staff tend to forget they are 16 years old. They need to involve more players so that they can put together solid back to back games. Having not seen this generation from the Czech Republic was a pleasant surprise. The players have all the basic skills and the team is good in transition. However they are still learning to play together and could be a very interesting team this summer. Spain never really got going this year. It was up and down all the way. Moments they played well, they were magnificent and the potential is enormous. Unlike last year's team which was ready in April, this team is a long way from the finished product. Spain are the reference nation at U16 youth basketball so the expectation is high. Unfortunately we were not able to see Laia Flores play for Spain in this competition who was hurt on the eve of the tournament in France. For France it was a huff and puff tournament. The defeat against the Netherlands on day 1 woke the players up. However there appears to be a lot of work to do if many of the players on display here will take part of the final team in July.